Fishing will happen rain or shine in Islamorada, because in the "Sportfishing Capital of the World," nothing is going to stop a game fisherman. Of course, with an overall average high temperature of 82 degrees Fahrenheit (28 degrees Celsius) and an average low of 71 degrees Fahrenheit (22 degrees Fahrenheit), the weather isn't usually a worry. The maximum average rainfall on Islamorada usually falls in June, so avoid that month if you're looking forward to taking full advantage of all the island's unlimited outdoor recreation activities and attractions. Islamorada, located in South Florida's Keys and just an hour-and-a-half drive from Miami, experienced its highest recorded temperature of 98 degrees Fahrenheit (37 degrees Fahrenheit) in 1957 and the lowest recorded temperature was a very chilly 35 degrees Fahrenheit (2 degrees Celsius) in 1981. Like most of the islands of the Keys, Islamorada is full of incredible sea life and amazing beaches. Snorkel tours, scuba diving, and water sports abound, although chances are your hotel or inn can recommend an excellent place to go in the area. Packing for a vacation in Islamorada is pretty simple. Bring your bathing suit. Of course, you will also need resort-casual clothing for dining out, but relaxed, casual, and comfortable is the dress code. The style of the Keys is very relaxed and comfy so don't get bogged down on what to wear. The Florida Keys are not often affected by hurricanes but do know that the unpredictable storms are a possibility during the Atlantic hurricane season, which runs from June 1 through November 30. Hurricane Irma in 2017 did do some significant damage to the area, but most of the island's infrastructure and businesses have fully recovered. So, if you're planning on traveling down to Islamorada during hurricane season, be sure to check the weather reports ahead of time. Spring in Islamorada is warm and humid, but relatively dry. The city receives rain on just three or four days out of the month. This is also a busy time for tourism, so while you can expect crowds, you can also expect plenty of things to do. What to pack: Your swimsuit is a must-pack year-round in Islamorada, but you should also include lightweight clothing like shorts, T-shirts, and flowy blouses, and sandals. For fancier evenings, linen trousers or flowy maxi-style dresses are appropriate. Summer is hot, with high temperatures and humidity. You can expect rain on at least seven or eight days out of the month, with the heaviest precipitation occurring in June. Afternoon thunderstorms are a regular occurrence. Tourism is slower during these months, so you will find discounted rates on lodging and activities. What to pack: Summer is hot, so you'll want to be smart about what to pack to maximize your comfort. Shorts and T-shirts or tank tops will be the most comfortable things to wear, especially if you focus on natural materials and avoid polyester and the like. Sunscreen is also a must-pack. Temperatures cool off a bit by mid-October, and tourism slows down making this a nice time of the year to visit. Earlier in the fall, it's still quite hot, and September is very wet—receiving almost eight inches of rain spread across 10 days of the month. What to pack: Fall temperatures in Islamorada are still quite warm. You can pack many of the same things as you would for a spring or summer vacation, but you'll want to bring an umbrella or raingear in case you get stuck in a massive storm or downpour. 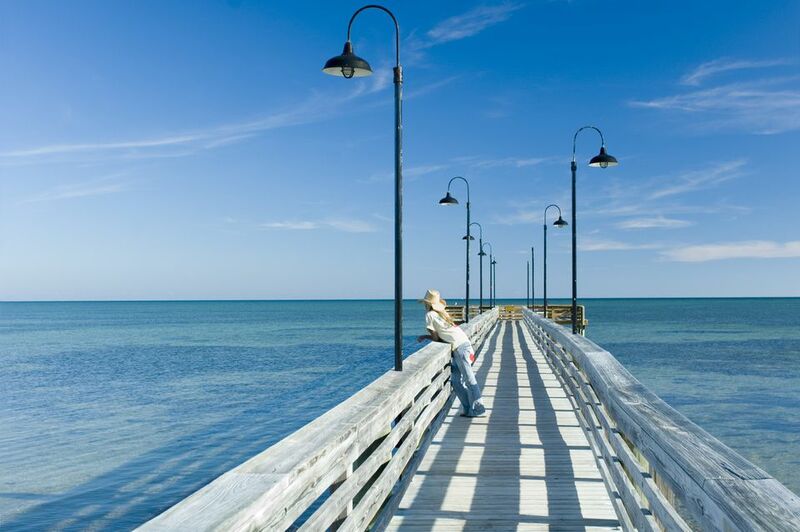 Warm-weather travelers will enjoy a winter spent in Islamorada. In addition to pleasant temperatures and low humidity compared to the summer, this is also a dry time of year, so you don't have to worry about rain spoiling your plans. What to pack: During winter, lightweight, beach clothing will be warm enough during the day time, but at night, you'll want to wear a light sweater or sweatshirt.